When: Saturday, April 27, 2019, 11 a.m.-1 p.m. Description: Easy to moderately challenging, depending on your speed and the trails selected. This time of year Tilden's meadows are filled with flowers. Our trails either cross the face of the ridge (easy 2.9mi.) or climb and follow the ridge (moderate, 3.6mi.). They are all wide, somewhat uneven dirt roads which gently undulate through meadows, pines, and firs. Where to meet: We will meet in the parking lot for the Quarry Picnic site, 780 Wildcat Canyon Road, on the south side of Wildcat Canyon Road, just west of Inspiration Point. There is an accessible toilet there. What to bring: Good hiking shoes or boots for the trails, layered clothing for variable weather, water, windbreaker, snacks. Hiking poles are optional, but always a good idea for the longer option. 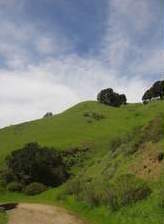 Drive to the East Bay Botanic Garden where Shasta Road and South Park Drive meet Wildcat Canyon Road in Tilden Park. Continue east (right) on Wildcat Canyon Road for about 1.25 miles to the Quarry Picnic site. Carpools: If you need a ride or can give a ride, call (510-548-0530) or email Audre (audrenew@gmail.com) TWO DAYS IN ADVANCE for arranging a pickup near your home or at a BART station. PUBLIC TRANSIT: see AC TRANSIT by calling 511, or on the internet at 511.org.